PORTACOOL Cyclone 1000 The PORTACOOL Cyclone 1000 1/3 HP Evaporative Cooler Motor helps cool indoor and outdoor areas. This powerful cooler simply runs on 120-Volt and tap water. The high-efficiency Kuul evaporative media and water help naturally cool the outdoor air and lower temperatures by up to 15 to 25 Degree F. This cooler can easily be transported and used in your home's backyard patios, garages, and workshops during the hot summer months or whenever cooling is needed. May also be used to cool indoor areas such as kitchens, bedrooms, and offices. 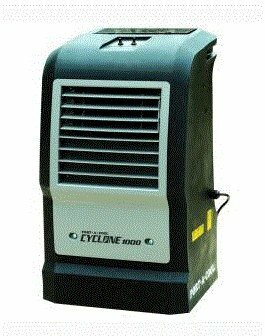 The Cyclone 1000 can cool areas up to 300 sq. ft. and can circulate air up to 1000 CFM. This evaporative cooler performs best in dry, arid climates; but may also be used in humid conditions. PORTACOOL Cyclone 1000 2-Speed Portable Evaporative Cooler for 300 sq. ft.